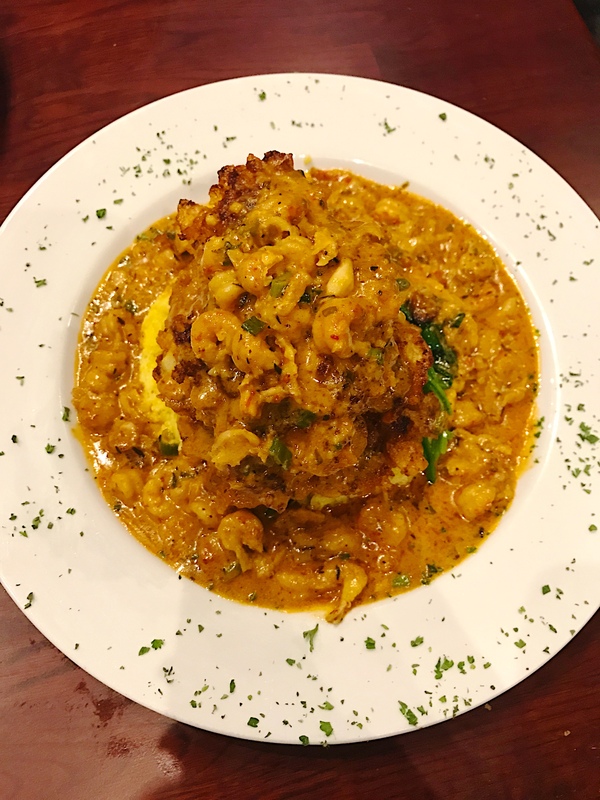 I have been craving some cajun seafood for quite some time and when I heard of Louisiana Bistreaux I had to go check it out. Louisiana Bistreaux focuses on bringing their guests wonderful cuisine of Louisiana in a casual setting. Their menu includes fresh seafood, steaks, gumbos, Jambalaya, Etouffee’s, and much more. I decided to go to Louisiana Bistreaux Tuesday night when they have a live band playing New Orleans tunes. The band was simply amazing and only added to my amazing experience overall with the restaurant. This place is perfect for a lunch or dinner with friends, date night, or even a work lunch. For my first dish, I had to try their Bistreaux Oysters. The Bistreaux Oysters comes with chargrilled Gulf Coast oysters on the half shell topped with white wine garlic butter and parmesan. The oysters were bigger than most restaurants, which I liked, and the garlic butter and parmesan gave an amazing taste to them. For my appetizer, I wanted to go out of my comfort zone and try their Gator Bites. I have never had alligator before, so I was excited when I received my dish. The Gator Bites come with tender gator tail strips, lightly seasoned and fried. To be honest, it tasted like chicken and was very good paired with their sauce. I was told that if I went to Louisiana Bistreaux I had to try their Crawtator Crusted Grouper. The Crawtator Crusted Grouper comes with grouper crusted with Zapp’s crawtator chips in a cajun crawfish cream sauce, served with sautéed spinach and our jalapeño gouda grits. Not only was the dish absolutely beautiful but the explosion of flavor made this dish my favorite of the night. I have to admit, I was apprehensive to order it since I have a love-hate relationship with grits. I am from the Midwest so I have never been a fan of grits. This dish absolutely made me rethink my position with their jalapeño gouda grits. The grits with the grouper and cream sauce were delicious. I loved that the portion size was big and the crust on the grouper was not as overwhelming as it looked. If you decide to dine with Lousiana Bistreaux, you have to order this dish! If you know anything about Louisiana, you know that beignets are their official state doughnut. The beignets are a fried donut covered with powdered sugar. I am not sure how my stomach had any room left but it definitely made space for this tasty dessert! Overall, I was very pleased with my dining experience at Louisiana Bistreaux. Their cuisine is fresh, proportioned very well, and absolutely delicious. I definitely recommend that you will enjoy their food and will leave not disappointed at all. Have you eaten at Louisiana Bistreaux? What was your favorite dish? I’m a vegetarian but I’d go for the beignets alone!